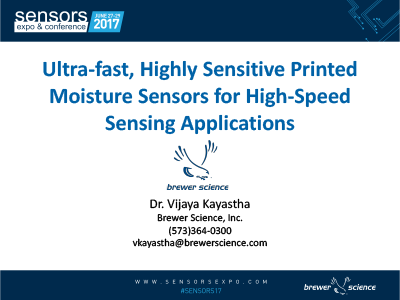 At the 2017 Sensors Expo & Conference that took place in San Jose, California last June, Dr. Vijaya Kayastha presented on an ultra-fast, highly sensitive printed moisture sensor developed at Brewer Science. Dr. Kayastha discussed the potential applications of these sensors that are not currently possible with existing commercial moisture sensors. These carbon-based, resistive-type sensors respond to fluctuations in humidity within 10 milliseconds. They have a flexible form factor and can be printed on any surface. These sensors can be integrated with many existing devices, including slow, but accurate, moisture sensors to achieve both ultrahigh speed and accuracy in a single sensor system. Potential applications for these sensors include: monitoring inert dry gas lines, monitoring glove boxes, lab process monitoring, breath monitoring, and speech recognition. If you are interested in our highly sensitive moisture sensors, learn more about our product specifications here: InFlect™ Moisture Sensor.